Do you want to help students grasp the essential truths of their faith? Then The Foundation Series is for you. Over the course of 3 years, your students will learn the big-picture story of the Bible as well as 34 core concepts of what it means to be a Christ-follower. The Foundation Series leads your students on a 3-year journey of faith-development based on the powerful truths of God’s Word. BUDGET SAVER! The Foundation Series includes access for unlimited teachers within your church! NO SHIPPING! The Foundation Series is downloadable and available as soon as you purchase. Help students understand the narrative of the Bible and how God has woven the trusth of the Gospel through all of Scripture. Help students lay the foundation of a lasting relationship with God through a study of the core concepts of their faith. Equip students to grow a dynamic faith by studying a variety of core spiritual truths. Do you want to help students grasp the essential truths of their faith? Then the Foundation Series is for you. Over the course of three years, your students will learn the big-picture story of the Bible as well as 25 core concepts of what it means to be a Christ-follower. The Foundation Series leads your students on a journey of faith-development based on the powerful truths of God’s Word. 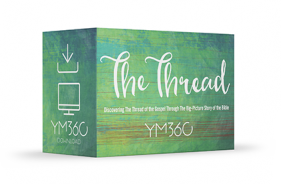 Year 1 of the Foundation Series is a 52-week study called The Thread: Discovering the Thread of the Gospel Through the Big-Picture Story of the Bible. In this first year, you’ll help students understand the narrative of the Bible and how God has woven the truth of the Gospel through all of Scripture. The second year in the Foundation Series is Activate: The Building Blocks of Faith, a 52-week study that equips students to lay the foundation of a lasting relationship with God through a study of the core concepts of their faith. The third year in the series is Amplify: Growing A Faith That Lasts, a 52-week study that encourages students to grow a dynamic faith by studying a variety of core spiritual truths. Download the scope and sequence for The Foundation Series, a 3-year Bible study series! Download the sample pack for The Foundation Series, a 3-year Bible study series, and get an up close look at Lesson Plans, Teacher Prep Videos, Parent Pages, Student Devotions, and Social Media Content!